We here at POTN.co.uk HQ have been car enthusiasts since the day we opened and for the many years after. We have remained enthusiasts and only work with the best brands in the industry because of it. The team have been asked alot recently by customers about where to start when trying to improve their car, so here is our top 5 moddification tips. Get the engine breathing better – Air Filters. This is by far the most common mod to do, it’s often easy to install and you can expect some descent flow from it. Breathing mods are often fairly inexpensive (Panel filters from £37.99). Making it a great place to start. OEM air intakes are usually very cheap and very restrictive, my favourite way of describing it is imagine you have a cold, often out of breath and can’t move very fast, a filter is like removing the cold, an intake would be like having bigger pipes in your nose to breathe even more air through, which would make you feel better and want to move more. POTN works closely with Pipercross to get our staff factory trained to ensure knowledge is high which is key to providing the best service. We hold great stock in our warehouse and order new stock in daily. Our great stock means we can offer same day dispatch! With the forever growing market the range of breathing mods has certainly increased, from your typical panel air filter (with life time guarantee) it’s a smart mod for someone who doesn’t want to apply much work but wants better MPG and performance and saving you money as you would no longer have to replace in your service only clean. A simple remove and replace part. 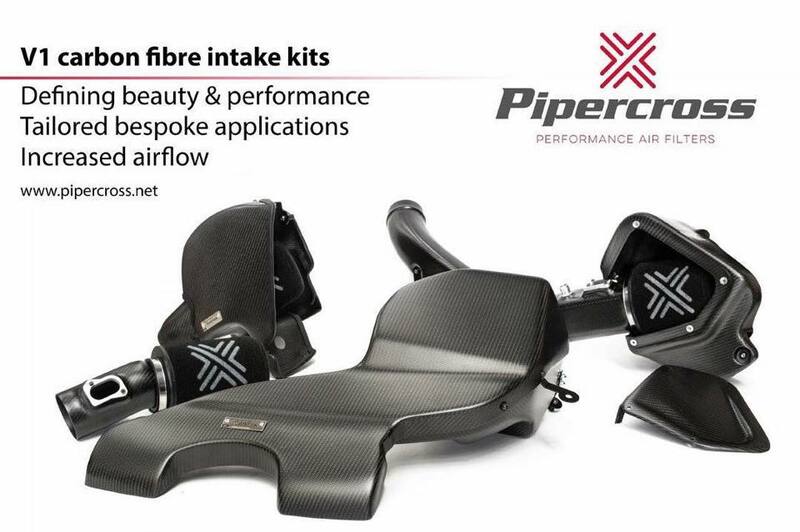 From this we then offer induction kits, this is a little more serious with better performance gains, typically this removes your heavy and often restrictive air intake and replaces it with our version which will have a less restrictive and often larger filter area in the form of a cone. This is a popular modification and is simple to install. once these are installed a remap or tuning of your vehicle will give you larger benefits then with your standard air intake. 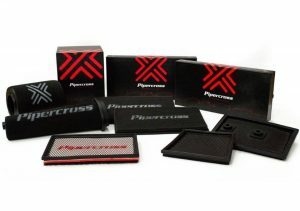 Then the next stage (yes there is another level and Pipercross own it) We offer the Pipercross V1 range, this product is for the customer who is looking for performance and exceptional looks. these sit perfectly in the engine bay and the full carbon box deffinitley will make people look twice when your bonnet is open. These can be found on cars like the Liberty Walk mustang, seen at the best shows throughout the year. The Cars handling – Suspension. 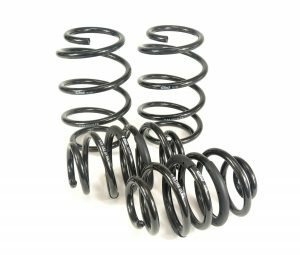 There is so many brands out there for springs, here at POTN we work with 2 spring suspension specialists. 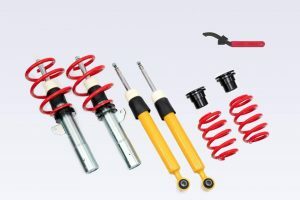 Eibach and Vmaxx, Springs are a good place to start if your looking to improve the handling and wanting to keep the cost down, a direct replacement for OEM the shorter drop giving your the lower centre of gravity helps enormously with your handling. The spring manufactures changing the spring rate helps you firm up or soften the ride also. Not forgetting the smaller arch gap giving you better looks. Eibach have been very performance orientated with very high TUV approval and developing some of the best kits in the world. 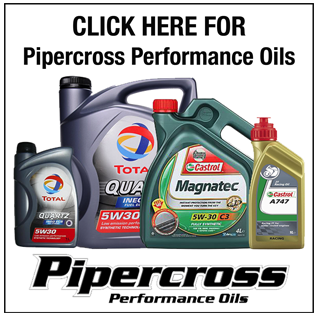 appearing consistently on OEM cars such as Mclaren and Volkswagen and the rest. developing there springs in Motorsport also such as F1 and rallys. Vmaxx is a continuously growing product with great value for money, with good stock held in the UK and Europe. Vmaxx take into account what the people want offering good lowering amounts. with coilovers being very popular especially on Transporters and Caddys. 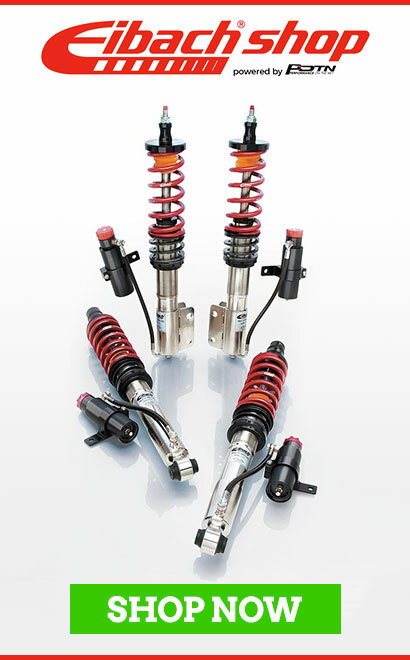 Dampers – shocks can make a huge difference to your vehicle. Wether it is an old beauty or a brand spanking new car, dampers are now produced in mass and can be made cheaply giving you a very ‘Crashy’ Ride and often find ourselves on the phone to a customer looking for a more comfortable set up, from this we have found replacing with Bilstein is a good place to start with the perofmance range being offered for pretty much everything now, you can find your car handling better and sticking to the same height, with the B6’s offering around 20% firmness to the ride. However if you are lower, the B8 shock similar to the B6 but it is shorter in length allowing you to lower your car but not put to much stress on your strut. This allows for a firmer ride but helps prevent banging off the bump stops at every small dip in the road. 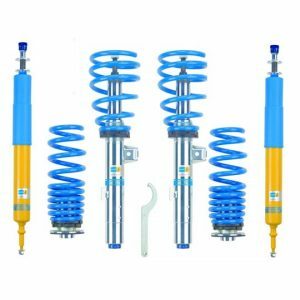 Next up from the Bilstein range would be a Coilover, this is a common suspension change, where you get a spring and shock partnered together with height and dampening adjustability possible, allowing for a more custom set up allowing you to feel much more in control in set up of your car, wether you want it slammed or stanced perfectly for track it would be up to you and easy to change and test out what you like. The full Bilstein range available from us through The Bilstein Suspension Store . Brakes are often forgotten, but standard car brakes are not always designed for performance and consistently starting and stopping quickly such as they would be on a track. 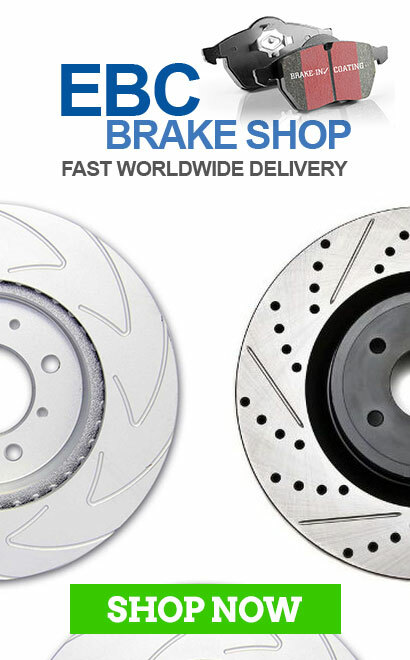 Here at POTN we have powered EBC Brakeshop.co.uk since day 1 offering the best knowledge and prices for the UK made Brakes with the Headquaters here in Northampton. EBC have a fantastic range, covering pretty much car on the road in the UK plus the odd American muscle. From Ultimax standard replacement pads to the exceptional Performance based YellowStuff. 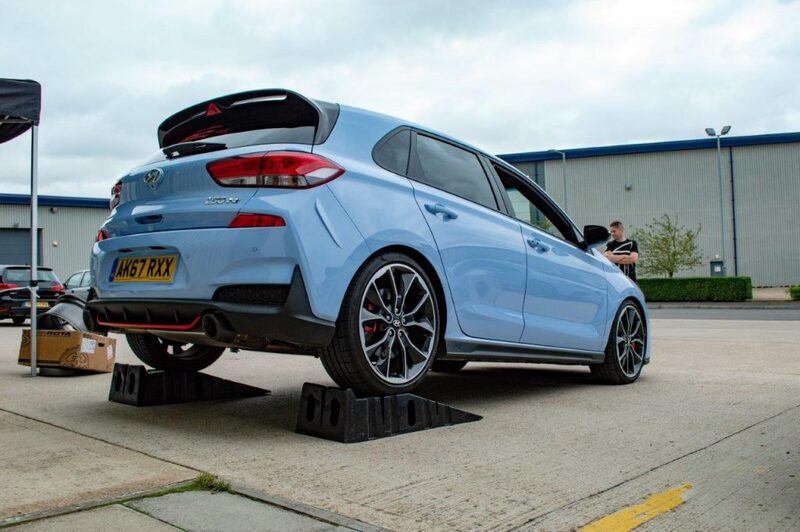 Get your car stopping better allowing you to go faster for longer before the stop pedal has to be pushed, often giving you the edge in any competition. 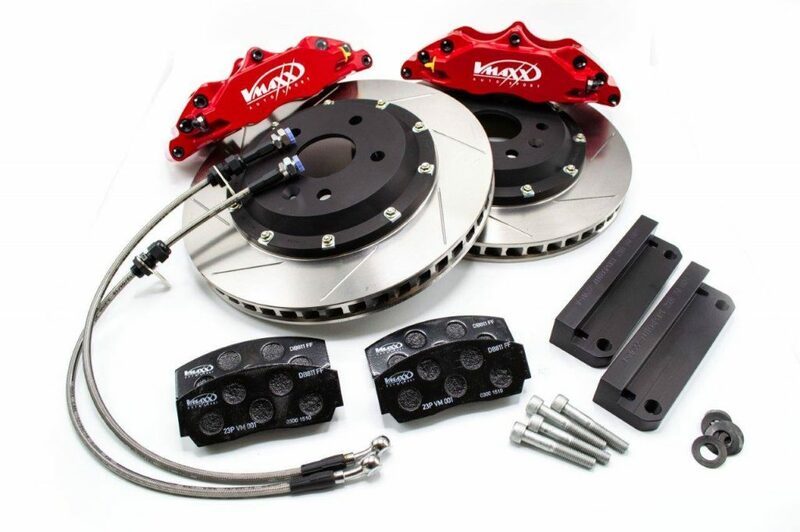 Not only EBC but we have been retailing V-Maxx big brake kits for years, TUV approved and fantastic value for money. They have always been popular, especially the colour range they offer is just rather eye catching. I would strongly advise getting in touch to get colours and pricing for your model. The look – Get your wheels. Wheels often the most biggest decision you have when customizing your car, wheels can change the looks of a car drastically. 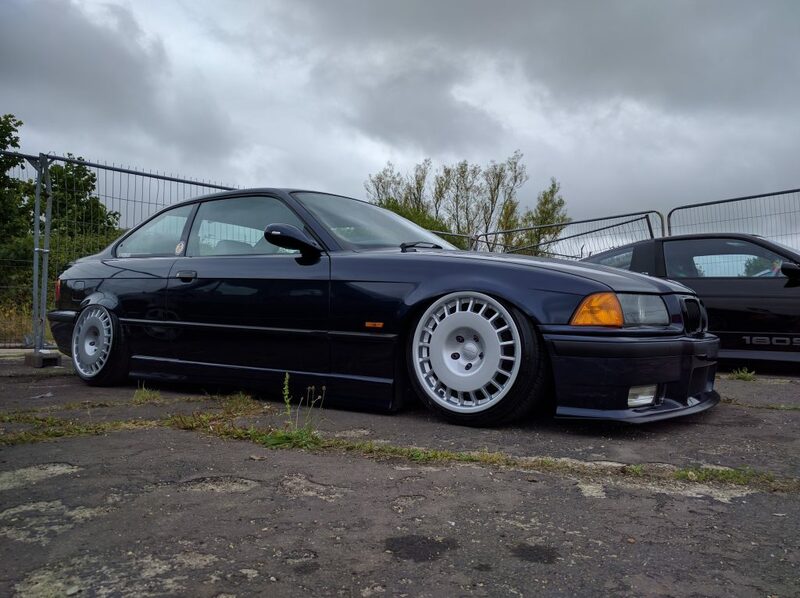 here at POTN.co.uk we have Rotashop to hand offering the full range of ever so popular Rota wheels being found in every car scene and motosport such as the British drift championship. with many designs there will be lots to choose from. wether it is the iconic and infamous Rota Grid or the low and wide Rota BM8. Make sure you check out Rotashop.co.uk and contact them for the best set ups! Not only that but POTN have also been retailers of Calibre wheels for sometime a great value for money wheel and perfect for anyone looking for that OEM plus styling. 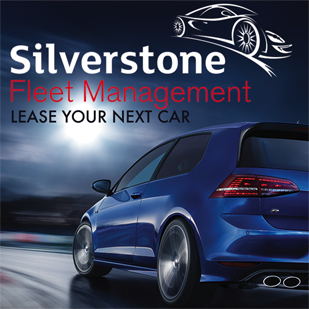 Popular wheels such as the Calibre Friction can be found on cars like the Mk7 Fiesta with regular deals and great stock this is a wheel brand not to forget. check it out here for Calibre and more! 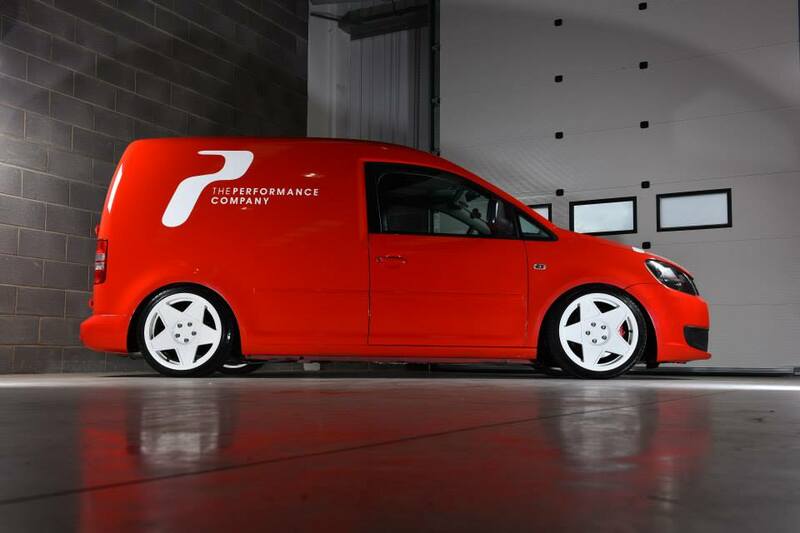 Felgen Werkes will be offering 3SDM, Rotiform, OZ Rota, 1552 and more…. The Sound – The Exhaust. The Exhaust is usually the bit that puts a smile on your face, wether it’s Asbo loud or more mature sounding we have you covered. from opening out of the box and seeing the shiny silver from the stainless steel glissen in front of you to finally fitting it to the project and hearing it when you fire her up for the first time. here at POTN.co.uk we have been selling Remus for some time and working closely with Remus UK to offer great delivery times and the best knowledge in the business. Remus exhausts have been the first choice for Mercedes-benz in there performance range and their DTM Race cars. This is always reassuring when wondering the quality of a product. Remus exhausts are now often valved ensuring they work with the original car system or remote controlled so the system can suit your mood and environment. Make sure you checkout the shop now section on the site and see what we can offer you now.